Winning Ugly was a term thrown out there to describe the Lions win over Broadbeach and there was certainly some accuracy to that comment. Whilst the Lions controlled the majority of the game, there were plenty of errors and many of the Lions better players were unusually missing easy targets all round the ground. 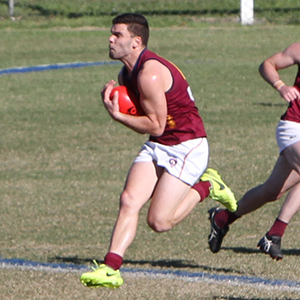 Several of Broadbeach’s goals were directly attributable to skill errors and the Lions seemed at one stage to be doing all they could to hand Broadbeach the game. 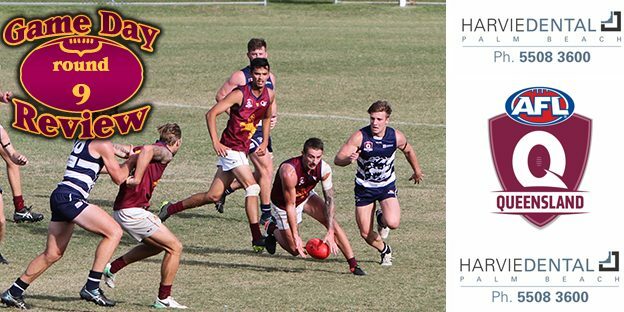 Despite this and a spirited challenge from Broadbeach, the Lions did steady after the final break to take the 21 point win and move into outright second position on the QAFL Ladder. Coach Chad Owens made a couple of handy moves at the 3 quarter time break moving Josh Woolley, who had been having a very rare off day for the Lions, to full forward and also moving Tyler Cornish more into the midfield. The changes had immediate effect with these two being key contributors in the final quarter. 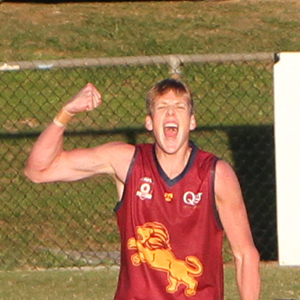 Josh Woolley bagged two valuable goals for the Lions in the final term. Liam McNeven was outstanding for the Lions in defence, playing arguably his best game for the year, along with fellow defender Ben Headland, who was again a fantastic contributor. 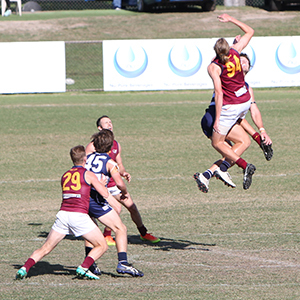 Their defensive efforts were a highlight and saw many Broadbeach attacks repelled. Jake Dignan, Brock Askey, Jed Harrison were also amongst the better players on the day. The Reserves came up short with a 34 point loss, but there efforts were to be commended as they battled hard whilst losing several players to injury during the game. The Colts were behind all game and although they staged a strong comeback in the last quarter, the young Lions also fell short by only 3 points. The Lions will want to be on the improve over the next couple of weeks as they tackle Morningside at home this week followed by a top of the table clash with Labrador the week after. With outright 2nd spot up for grabs the boys came out firing but couldn’t land the killer blow through inaccuracy and poor field kicking. In what was looking like being a one sided game we lost our way and work rate for each other. Making 8 changes from the previous weekend makes it hard but the boys found a way to make it work. Young debutants Lewis McNally and Riley Mayne acquitted themselves playing key positions takes and will certainly be better for the experience. Ben Headland continued his outstanding season stopping a dangerous opponent and providing composure and decision making. Jake Dignan was crucial at the contest and set up many forward thrusts. Lachlan Ritchie worked hard as a forward but didn’t quite finish off with goals. At the halfway mark of the season we sit 6 points clear in 2nd position and have a massive month ahead of us. We will continue to work hard on the track and working on our deficiencies to give ourselves the best chance of finishing as high as we can on the ladder. Looking forward to 2 home games in a row against old foes Morningside and Labrador. Hopefully we see a lot of our loyal supporters there cheering the boys on. Not a good day for our boys today with a bad loss at Broadbeach . First half we played stop start footy with a lack of intensity, urgency and desire. Basic errors and general sloppiness were the theme of the first half and we went into the main break seven points down. We sensed that we could step up the gears as good sides do. Immediately after the break we played our best footy kicking 4 goals to nil. Unfortunately our injuries were mounting and once Tommy Fraser went off early in the third with a bad finger injury, we were down to no interchange bench. With both Sean Goody and Dale Neuhaus playing their first games for the year, therefore naturally lacking a bit of conditioning, our energy levels were being severely tested. Despite no rotations being available we held a 3 point lead at the last change which was a brave and courageous effort by all those still out on the ground. As to be expected our legs gave way and our depleted bench took its toll with Broadbeach running away with the game, the final losing margin of 6 goals certainly not an accurate reflection of our efforts. Again our team showed enormous courage and character being undermanned and playing out the game with only 16 fit players. But we do also need to address why our first half was lacklustre and full of basic errors. That’s the challenge for us all now to ensure we bounce back against ladder leaders Morningside this week at home. With clear second position on the ladder up for grabs, the boys would have to play their best football against Broadbeach. After a few injuries from Round 8, we knew that a few changes would happen. Not the best scenario for this week’s challenge but that’s football. Ioan Jones and Tyson Schuener where big outs with injuries, adding to this Jordan Burns, Tom Woodman, Logan Schlager and Ryan Suddes all out with other commitment. We had to rely on the great support Palmy Under 16 have shown us so far this season to fill a team. Thank you to the following players who played Friday night and again for us Saturday morning; Angus Phelan, Harry Day, Bronson Howard and Jed Melzer. First quarter saw us get out to a 5-point lead with two goals scores by Patrick Jago and Matthew Oats. Hunter Hughes was a welcome inclusion into our team for his first game for the club and we saw what he is capable of, winning the ball out of the centre from Jarred Neuhaus great ruck work. Second quarter, Broadbeach hit back with 3 quick goals, going into half time 5 point up. Hunter Hall lead the boys well trying to keep up the fighting spirit up out on the field with Liam O’Brien and Lachlan Blackmore both kicking a goal. Angus Phelan dominated down back when Broadbeach had a run on. Going into the shed, the boys look flat and defeated. We need to learn that when the pressure is applied to us that we respond not drop our heads. 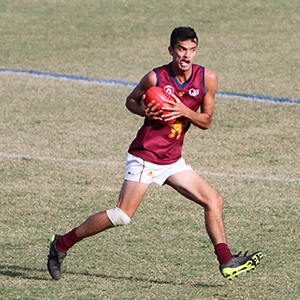 Broadbeach took hold of the game in the third quarter keeping us scoreless, while they added 5 goals 3 behinds to their score. Our forwards need to be more accountable for their man as Broadbeach backline just run the ball out with no pressure, making it almost impossible for our defensive line-up to stop the onslaught. Broadbeach going into the last quarter with a 37-point lead. Last quarter was going to determine what type of team we are. Are we the team how gives up or fights to the final seconds? To the boys credit the kept Broadbeach scoreless in the last while adding 5 goals 4 behinds to our score. Unfortunately, we need an extra 2 mins on the clock when the siren went and the ball was in our forward 50. Liam O’Brien opened the scoring in the first minute with a goal, followed by Billy McAllister, Riley Engels, Jeht Wollington and Ben Stubbs. Our fight back from 6 goals down was the highlight of the day. Now our focus turns to Morningside. If we play four quarters of football like the last quarter today we can take the 4 points next week.